Guys! I started something. I think. Since we moved to East Aurora, we’ve traditionally stayed in town and done Thanksgiving with Andrew’s parents, which means we eat early (like 1:30) and I can’t go downtown for the YMCA Turkey Trot. The 8k (5 miles) race began in 1896 and is said to be ‘the oldest continually run footrace in North America,’ and is capped at 14,000 runners each year. It’s a huge deal around here, full of costumes and a great post-race party. Logistically, however, it’s a nightmare; parking is no where near the start, and with that many people, and a 9 am start, there is no way I’d be home before noon. So, you can imagine my disappointment each year to miss out on such an exciting and hallmark event in our area. For the last couple years, I’ve done my own exercise Thanksgiving morning, from a simple run to a ‘Gobble ’til You Wobble’ workout full of squats and lunges. This year, I posited an idea to our running group, which has grown to 20+ people who come out on Thursday nights for our weekly runs. Why not have our own race here in East Aurora?? With my heart racing, I posted the idea to our Facebook page and waited. There HAD to be more people like me whose cooking responsibilities precluded them from doing the run downtown, right? But what if people hated it? They didn’t hate it. While many of our runners are loyal to the downtown event–and will continue to be–I got others who said they’d be interested in doing the run, or perhaps next year (as they were already signed up for the other one). In the days leading up to the run, I promised baked goods as a post-race goodie, made a sign and planned a route. A small handful came out, and I was thrilled when one of our regulars brought her husband along, too. 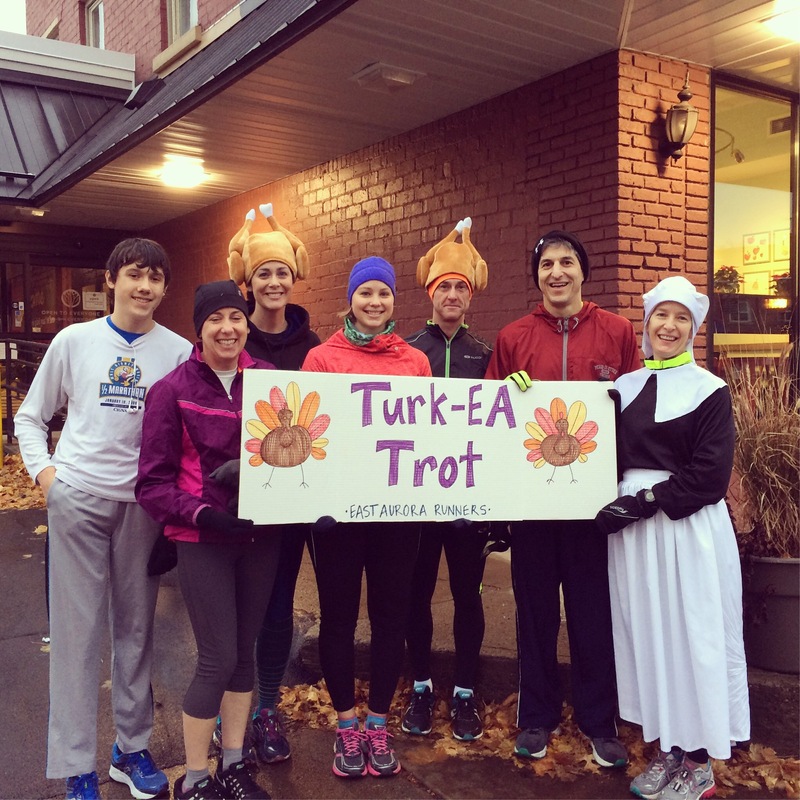 Seven of us ran the inaugural ‘Turk-EA Trot’ (name compliments of a friend) and had a blast. The weather was mild, a few came in costume, and we brightened the smiles of those we passed on the road. Once we finished and were enjoying some coffee from the East Aurora Cooperative Market (where we met), multiple passers-by were interested in our run and lamented that they hadn’t known about it. I explained that I’d only mentioned it to the running group, but that we planned to do it again next year! The general manager at the co-op, a friend, was psyched to see us using the store as a meeting place (our new weekend morning run starting location, FYI) and promised help with the run next year. I’d be lying if I said I hadn’t already had visions of becoming a ‘race director-extraordinaire’ with that first Facebook post. I’d love to one day have real registration and t-shirts and goodie bags and road closures. To attract runners from not just East Aurora, but from Orchard Park and West Seneca and Elma. To have costume contests and prizes. For now, I’m happy to do some homework on what it takes to become a real race, and bring treats for those who come out next year. I’ll bake until the race is too big! Posted on November 30, 2016 by thehealthypineapplePosted in i ♥ runningTagged eacm, East Aurora, east aurora co-op, East Aurora Runners, Running, turk-ea trot, turkey trot, YMCA Turkey Trot. Next Next post: we’re halfway there! Glad that the inaugural event happened and it looks like you have a promising start for next year! The name is super cute. Thanks! I really hope it will grow into a fun event so that everyone in the Southtowns (here outside Buffalo) can enjoy a turkey trot and still have time to cook or be with family. I’m guessing you do a turkey trot each year?